What's SpongeBob to do when a litter of six baby snails is left meowing and hungry on his pineapple's doorstep? And what's Gary to do when all of SpongeBob's time is taken up by the cuddly critters? Find out in “Litter Box Blues,” featuring the art of Ignatz Award nominee Carolyn Nowack (Lumberjanes). Plus, in “Who Is Mermaid Girl?” (Part 2 of 2), SpongeBob and Sandy are getting closer to the truth about Mermaid Girl's identity–and the final clue lies in a legendary lost episode of the “Mermaid Man” TV show! 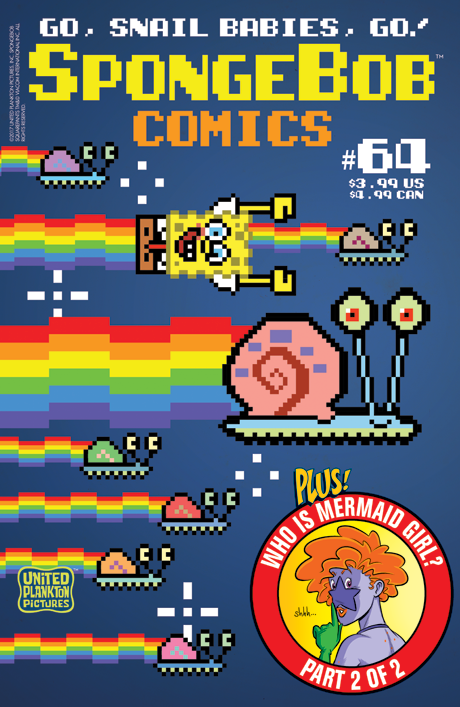 Also: SpongeBob goes virtual jellyfishing, holds a best-friend contest, and more!